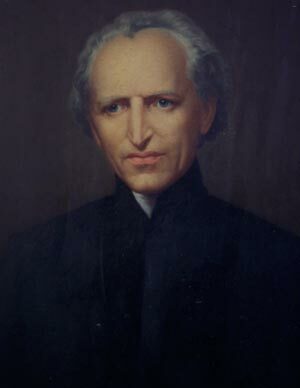 Blessed Basil Anthony Mary Moreau, CSC (February 11, 1799-January 20, 1873) was the French priest who founded the Congregation of Holy Cross from which three additional congregations were founded, namely the Marianites of Holy Cross and the Sisters of the Holy Cross . Father Moreau was beatified on September 15, 2007 in Le Mans, France. Born on February 11, 1799, in Laign�-en-Belin , a small village near Le Mans , France, Fr. Moreau grew up in the midst of the turmoil of the French Revolution . As his parents were devout Catholics involved in the underground Church, the aspect of the Revolution which most affected him was the suppression of the Church. The ninth of 14 children, Basil was accustomed to a sparse life; yet, by the generosity of his pastor who tutored him, he was able to achieve a good primary education. Feeling himself called to the priesthood, Basil entered the diocesan seminary in 1814, when the hostilities of the Revolution toward the Church had subsided. The seminary was run by the Society of Saint-Sulpice and schooled him in the French school of spirituality which remained an inspiration in his preaching and writings all his life. At age 22 in 1821, Basil Moreau was ordained a priest of the Diocese of Le Mans at the Old Visitation Convent Chapel of the Sacred Heart , while the Cathedral of St. Julien in Le Mans was under restoration. Restoration of the Church was the principal theme and work of Fr. Moreau's life. As most of the pastors and teachers in France before the Revolution were priests and religious who were forced into exile, by the 1820s most of the nation was ill- catechized , illiterate , and without the benefit of the sacraments . As a young priest and throughout his life, Basil was an effective preacher who preached parish missions and offered the sacraments on an itinerant basis to rekindle the neglected faith in towns and villages throughout the region. In 1835, many things happened that would be central to Fr. Moreau's work for the rest of his life. He was assigned to be the assistant superior of the seminary at Le Mans, where he was a popular and inspiring professor of theology . He founded a group of priests within the Diocese of Le Mans that would assist him in his various endeavors to re-invigorate the Church throughout the region, especially preaching parish missions. He called them the Society of Auxiliary Priests. In the same year, an older priest of the same diocese, Fr. Jacques-Francois Dujari� , who fifteen years before in 1820 had founded a band of young men to re-establish and teach in the schools throughout the region, handed responsibility for them over to Fr. Moreau on account of his failing health. While not technically religious because they had not made a novitiate or taken public vows, many of these young men, known as the Brothers of St. Joseph , desired to become a recognized religious organization. 1799 Born February 11, 1799 in Laign�-en-Belin , a village near Le Mans , France, the 9th of 14 children; his father was a wine merchant. 1835 Taught and served as assistant superior in Le Mans; named leader of the Brothers of St. Joseph founded by Fr. Jacques Dujari�. Founded the society of Auxiliary Priests. 1844 Received the vows of L�ocadie Gascoin and three Marianites.